The origin story of the reel and of reelyActive. 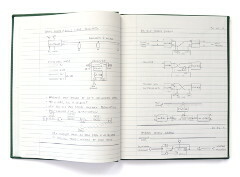 While the first sketch of a "Generic RFID Tag/Receiver" dates to December 2010, the first sketch of what would become the reel architecture was entered in Jeff's notebook on Valentine's Day 2011. 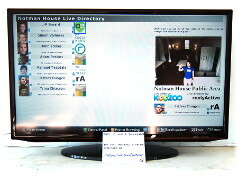 The first recorded use of the term "reel" dates to March 2011. 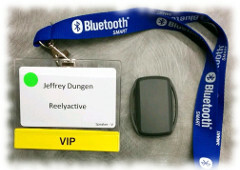 Not long after, while passing the time waiting for a flight, thinking about the future of "Active" RFID, the name reelyActive was coined and the domain promptly registered. 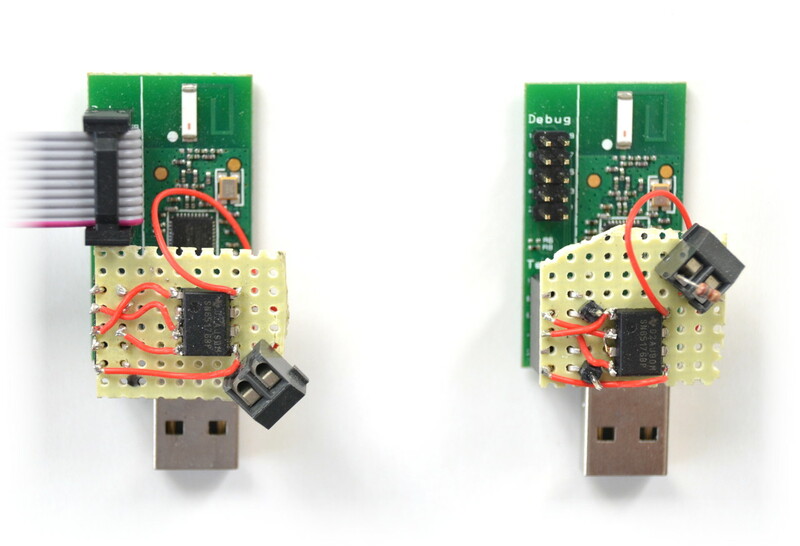 Using development boards and rudimentary daughterboards assembled from parts on hand, the concept of relaying decoded radio packets via daisy-chained infrastructure was successfully validated for the first time. 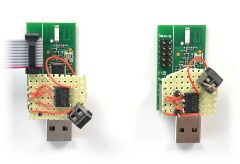 Simple, inexpensive, versatile Active RFID. No existing Active RFID technology combines these qualities. That is our edge. That was the title slide of the pitch by Jeff to prospective co-founders Traian, Pier-Olivier and Olivier. 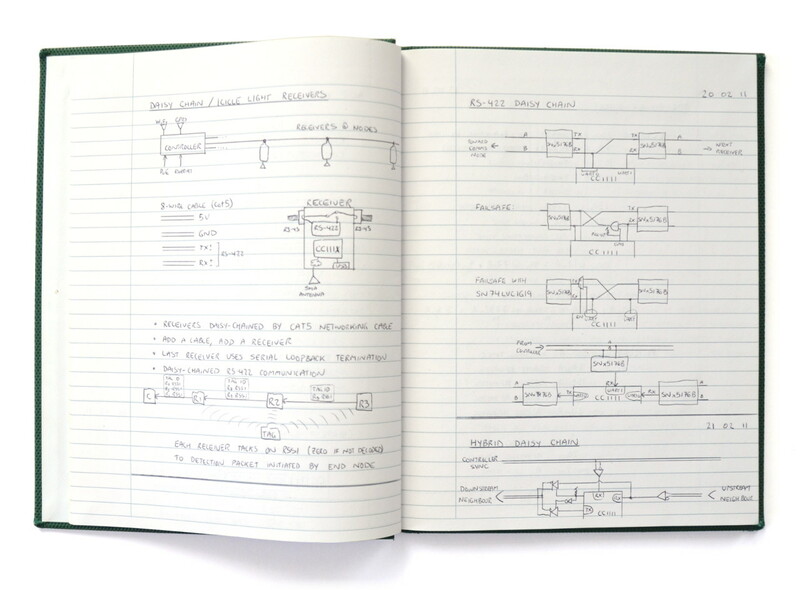 Proposed was the open source software foundation still used today. Traian produced and hand-assembled the JTR-02 prototype reelceiver on New Year's Eve. It worked. The critical proof of concept was complete. Silicon Valley startup ParqPlace signed on as the initial client with the intent to use the nascent platform as a competitive edge in the race to become the "AirBnB of Parking". Reels would provide a reliable, cost-effective means to identify tagged cars on infill parking lots. Several prototype iterations would result in the RA-R422-02 reelceiver and RA-T411-02 tag — both of which are still in production today. 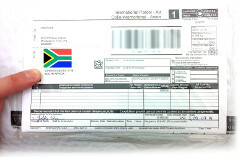 ParqPlace would receive their first production inventory the following month. Nothing to fear about thinking big. 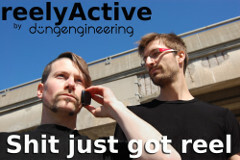 reelyActive would be incorporated as a Québec numbered corporation on July 24th, 2012 with co-founders Pier-Olivier (left), Jeff (centre) and Traian (right) as its administrators. Our first formal pitch to an audience was on day one of the cohort. 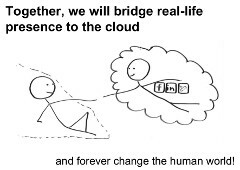 We were the Proximity Identification Platform and we were going to "bridge real-life presence to the cloud — and forever change the human world!" Years later we'd blog about our reflections on that pitch. We created a live directory for members of the cohort and other occupants of Notman House. Anyone could create their own digital profile and have it appear on screen when they were present with one of our active RFID tags. With the Internet of Things suddenly becoming the thing, IoT became the focus of not only our Demo Day pitch (which you can watch here), but of our business itself. The year with more than a LitL Shameless Self Promotion. 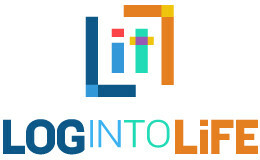 Driven by the unexpected success of our live directory experiment, and people's eagerness to be digitally discoverable through their physical presence, we developed Log in to Life (explainer video). 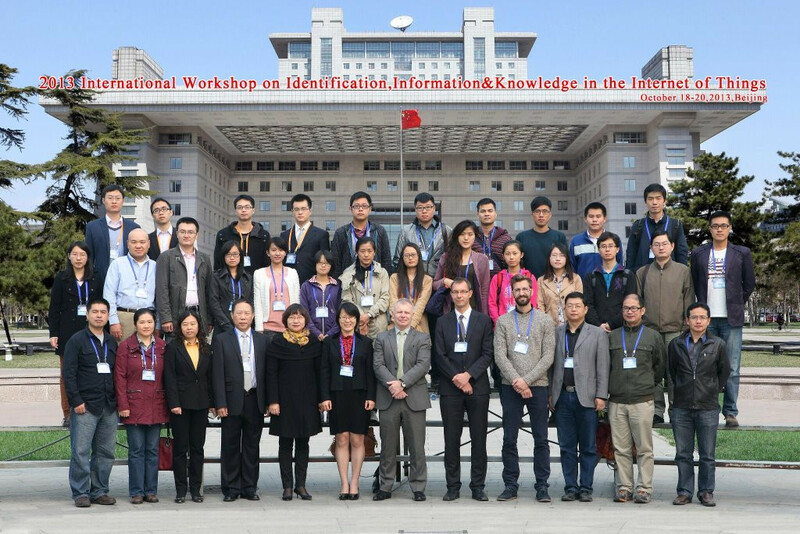 Nonetheless, the challenge remained that a person needed to carry our active RFID tag to be discoverable. That challenge could be overcome where people expected to wear identification: we tagged all the VIP badges to bring Log in to Life to the International Startup Festival. 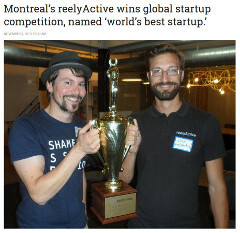 It was a huge hit among participants and organisers alike (case study), as were our infamous Shameless Self Promotion t-shirts, and we won a competition to become Montréal's Best Startup! 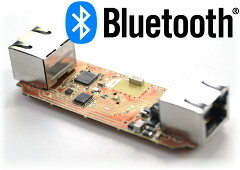 In anticipation of Apple's iBeacon launch, a Bluetooth Low Energy (BLE) reelceiver was developed and, to coincide with that event, we unveiled our Beyond the Beacon video (which continues to be our most watched to date) and which sparked controversy when it was covered in GigaOM: why were we doing beacons backwards? Another point of controversy was our decision to publish rather than patent. 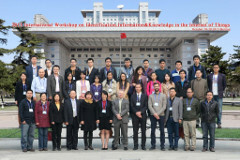 Pier-Olivier travelled to Beijing and Sydney to present our first two scientific publications on Hyperlocal Context and our reel architecture respectively. Capping off an unforgetable year, at Startup World's global finals in San Francisco, reelyActive beat out startups from Europe, Africa and the Americas to claim the title World's Best Startup (Press). Our pitch was all about context. Piecing together the platform, learning from early adopters. Thanks to our controversial Beyond the Beacon video, Jeff was invited to present our vision for BLE on the main stage at Bluetooth World in Santa Clara. 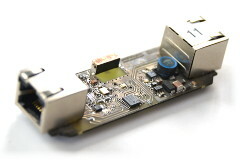 More importantly, we were able to use the occasion to convince Texas Instruments to provide us with the full (normally restricted) documentation for the BLE chip on our reelceiver, enabling us to pursue that vision with a competitive edge. 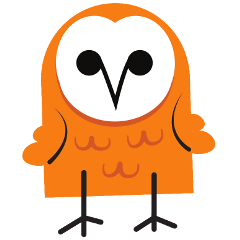 While the origins of the barnowl software package date to 2013, it was only by way of favour from designer Chris Olimpo, who had then recently produced our Smart Spaces put Things in Context explainer video, that the mascot would come to life. Indeed, barnowl would lead the way towards a series of software mascots. 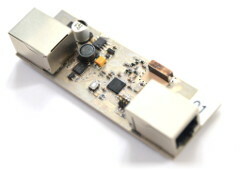 Thanks to the unique combination of our BLE reelceiver and open source software, described on our context.reelyactive.com website, prescient early adopters were eager to test our technology platform, and within months we had shipped to six continents (alas we're still missing Antarctica). 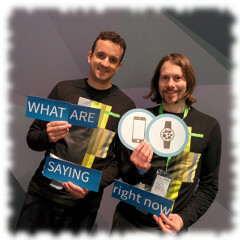 In March 2015, Juan would join the team, travelling with Jeff to CeBIT in Germany to represent reelyActive as the only Canadian startup selected for CODE_n's Into the Internet of Things showcase and competition. Benoit too would join the team later in the year. 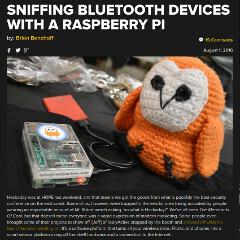 In October, our barnowl mascot had come to life as a stuffy, and in December we would present our next scientific publication, co-authored by Imran (our summer intern), at the IEEE World Forum on IoT in Milan. 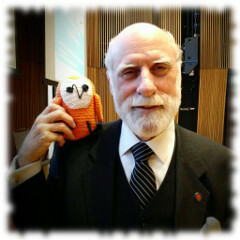 Whooooo would have thought barnowl would get to meet Vint Cerf following his keynote (which we much appreciated)! Persistence pays off as platform adoption progresses steadily. Following a development push throughout the Spring of 2016, our Pareto SaaS was launched along with an entry-level starter kit and a well-defined trial program. The new product offering responded to the needs of a growing, broader audience. Taking advantage of the inexpensive Raspberry Pi 3's BLE capabilities, we created a simple, versatile launchpad for experimentation with our open source code (tutorial). Thanks to coverage in Hackaday, a whole new audience was introduced to our vision and began building on our platform. 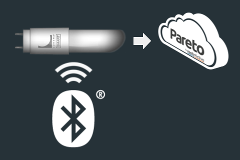 With Pareto and the open source tools now identifying countless different BLE devices from countless vendors (Bring-Your-Own-Device), and with integration of RAIN RFID into the platform on the horizon, the sniffypedia.org project was launched as a collaborative "phonebook for the IoT". The first smart light to listen for BLE was introduced by Lunera, and as their launch partner, the infrastructure challenge we had faced since the outset suddenly became an infrastructure opportunity: every building is filled with lights! We were now pioneering both BYOI and BYOD!